I am a VTech fan and have considered their phones on a number of occasions but the challenge is that we do not have a landline! We’re one of those families that only uses our cell phones so I never had a reason to really consider any of the VTech handsets. Well, VTech has changed the game for families like mine. The VTech DS6421-3 Connect to Cell is an all-in-one phone system that allows users to make and receive cellular and landline calls, while enjoying the high-definition audio sound clarity, comfort and ease of a VTech cordless home phone. It features the Connect to Cell technology which gives you the ability to make and receive both cellular calls and landline calls so you will never have to rush around searching for your phone again! I will admit that I have this problem fairly often! 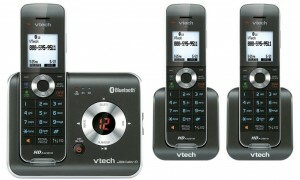 The VTech DS6421-3 Connect to Cell Phone uses bluetooth technology to connect to the cell phones that you pair with it, enabling users to make and receive cell phone calls utilizing the VTech handsets. The phone comes with 3 handsets which means you can have a handset in different rooms and on different floors! This gives you instant access to your cell phone even if it’s in a different room! If you do have a landline, the phone is also great because it allows you to answer calls from both the landline and the cell phone. 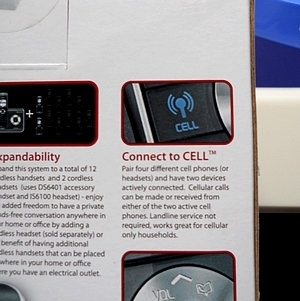 I also like that you can pair up to four different cell phones with the phone and have two connected at a time. This means that we can pair every cell phone in our house with the phone and then when both J and I are home we could have our phones connected. J always seems to have his phone on him so if we end up connecting more than one cell phone at a time it would probably be mine and Grambo’s because we’re the ones always missing calls! I have enjoyed my experience using this phone and didn’t even know that this technology existed. It’s great to see that there is technology that addresses the needs of all phone users whether you use a landline, cell phones, or both! You can purchase the VTech DS6421-3 Connect to Cell phone system for $79.95 right now with free shipping! It’s normally $99.95. I also found it on Amazon for $78.86 with FREE Super Saver Shipping! 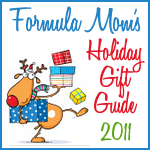 Originally published on 2011-12-20 by Mariah Moon at Formula Mom .